At CTL we are doing quite a bit of work with GEAR UP, a federal college access program the aim of which is to ensure low income students are prepared for and enter college. This federal initiative also supports Kentucky reform as embodied in SB 1 with its increased emphasis on college and career readiness. Some of the work we are engaged in has us providing guidance to school and district leadership teams in using classroom walkthrough and test data to pinpoint needs and develop a long-term professional development plan. While school leaders are charged with plan development as part of the district team, their responsibility doesn’t end there. 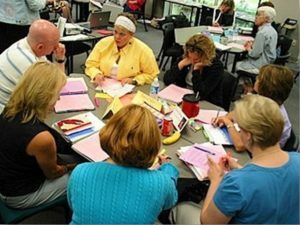 Once a plan is approved, it is up to the principal to ensure that faculty members implement the professional learning so that it becomes embedded in routine practice and results in increased student performance. Attended all professional development along with my faculty and engaged fully as a participant. Practiced new learning in classrooms and asked for feedback from my teacher colleagues. Observed teachers practicing new learning and provided them with feedback. Used faculty meetings and principal’s bulletins to communicate progress on implementation, highlight teachers who were doing an excellent job with integrating new practices into their instruction, and trouble shoot problems teachers encountered with implementation. Facilitated examination of student work to determine positive impact on student learning and to make adjustments as needed. Coordinated resources and efforts among this and other school improvement or PD initiatives. Communicated with students and parents about the professional development initiative we were engaged in, what we hoped to achieve, what they could expect to be different as a result of our participation, and how well it was going. There is plenty of research to document the critical role the principal plays in improving instructional practice and student achievement, and professional development leadership is an essential component of that role. This entry was posted in Blog and tagged college and career readiness, GEAR UP, leadership, SB1. Bookmark the permalink.